Soil and Ink » Blog Archive » Lovely ladies. 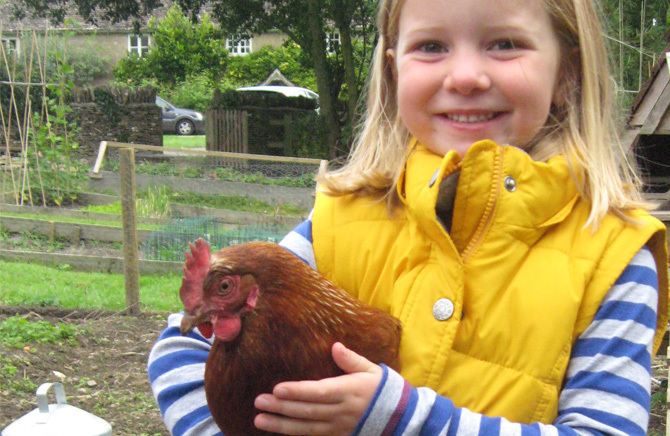 Chickens are great fun to have around and easy to tame, ours are willing to be held and stroked by the kids. 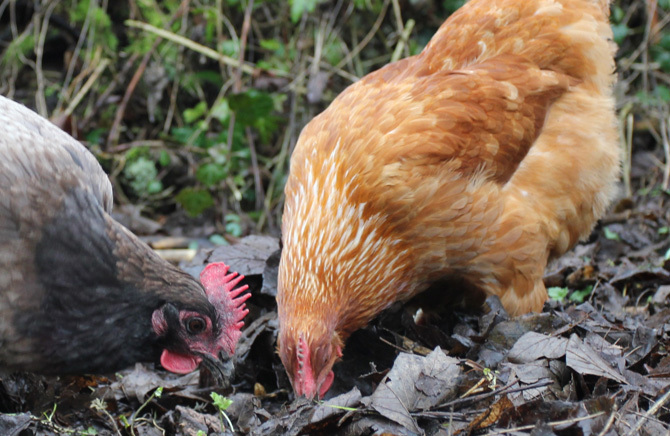 They follow me around the allotment and sit waiting for me to turn over some soil hoping to find worms and grubs. Chickens come in all shapes and colours I find that the brown ones are the most friendly, but if you take kids along to choose you will end up with one in every colour! they cost around £10 -£15 pounds per bird and should be point of lay (around 16 weeks old) and fully vaccinated. All the nutrient rich poo from inside the chicken house goes on the compost heap. 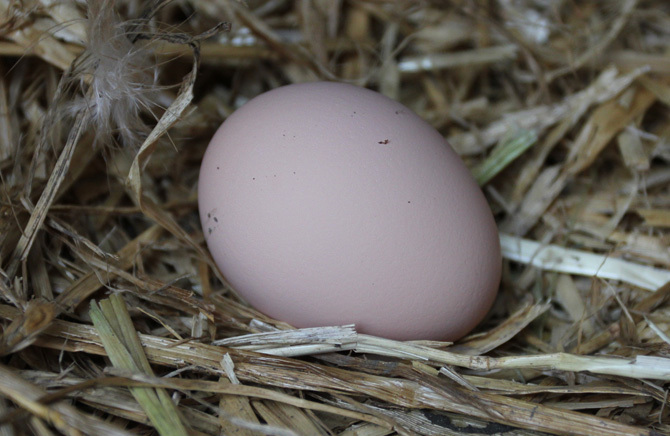 The eggs are amazing and you will get a plentiful supply from 3 hens, approx 750 per year, double yokers are a extra special surprise. 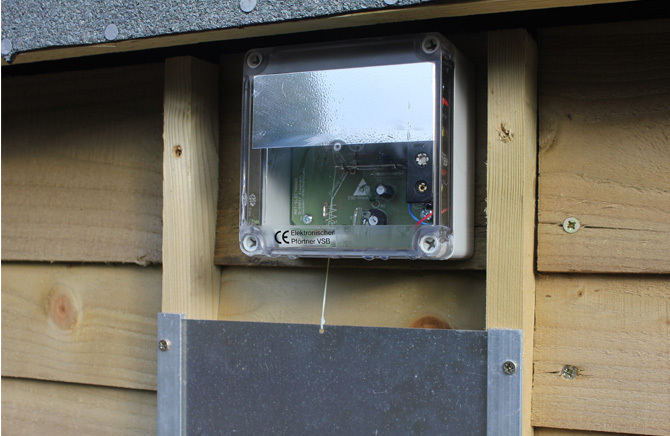 Get yourself a automatic door closer that slowly shuts at dusk so they are tucked up nice and safe, this will save you dashing down in the middle of the night to secure the door. 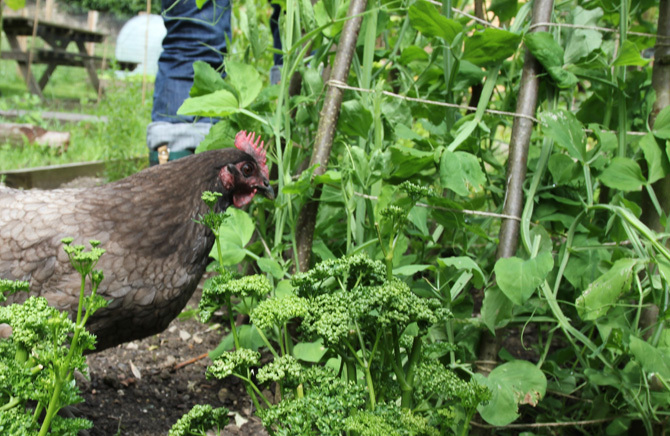 They will eat everything green and leafy at a startling rate so mine are only allowed to free range in the allotment during winter, they are in a run for the rest of the year. A few hens cost more to keep and house then buying organic eggs from the supermarket! A few of the costs include layered pellets, corn, bedding, wormer and mite powder. Foxes, buzzards and dogs are not friends of chickens. 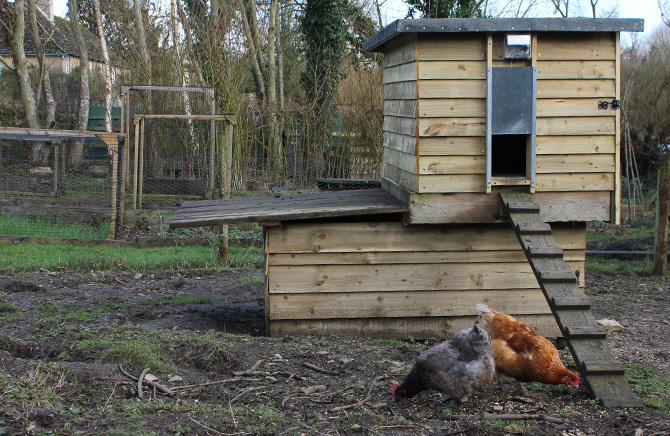 We built our wooden chicken house to a very simple design, it will last for years. Wooden houses that are cheap online are usually made from very thin wood so will not last. Omlet houses are fabulous and expensive! they fetch a good secondhand price on ebay so are a good investment. I have friends that have adapted old wardrobes into chicken houses which is a brilliant way to recycle if you’re handy with a saw. If the chickens get ill or too old then your have to be prepared to deal with them or find a friendly farmer who will do it for you!